Travelers hoping to fly to Europe for cheap now have one fewer option. Wow Air abruptly ceased operations on Wednesday night, canceled all of its flights, and left thousands of travelers stunned and stranded overseas. Wow, the popular Iceland-based discount airline, unexpectedly canceled all of its flights on Wednesday night and later acknowledged on its website that it has ceased operations as a company. The news came as a shock to many, chiefly those who have been left stranded around the world and must now scramble to find new flights. Affected passengers are advised to try and book new flights with other airlines offering "rescue fares," per a statement on Wow's website. The carrier also said that some passengers may be able to receive a refund. 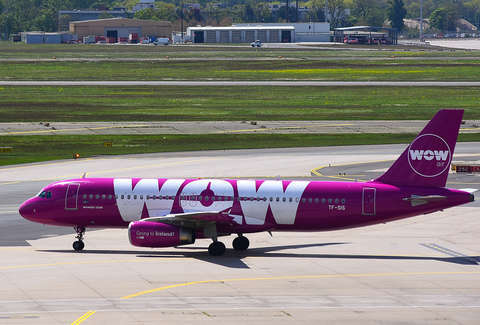 The drama unfolded quite confusingly for passengers waiting to board their Wow Air flights in a number of airports on both sides of the Atlantic late Wednesday and early Thursday. The news affects countless people who've arranged to travel on the airline in the coming months, most immediately the approximately 2,700 passengers Bloomberg reports were expecting to board the 29 Wow flights that were scheduled for Thursday. "This really scared everyone, at that point we were finally given back our bags and no money as of now has been issued back to me," Saurabh Aggarwal, a passenger due to fly from Toronto to Reykjavic on Wednesday night, told CNN. Twitter has been flooded with photos of chaotic airport scenes and plenty of frustrated messages from customers. The abrupt shutdown comes after the airline failed to raise enough cash to keep operations running, according to Bloomberg. Other popular European budget airlines like EasyJet and Norwegian Air are reportedly offering reduced fares for affected passengers, though it's unclear how people who've booked Wow Air tickets for the near-future should proceed. In its online message, Wow Air said people who purchased fares with a credit card should reach out to the credit card companies to see if they can get a refund. Wow Air's collapse will likely send a shockwave through the low-cost carrier industry, which has wooed passengers with deeply discounted transatlantic fares in recent years. It's sure to be a major blow to Iceland; specifically, as the airline -- which flew 3.5 million passengers last year alone -- was particularly popular with folks hoping to visit the Nordic island nation, and was credited with helping to usher in the tourism boom there.